Paul Krugman is a tireless writer. That's the good part. The bad part (you knew this was coming) is that...well, he can also be a tiresome writer. So there’s no question that right now, the demand side is what is constraining unemployment. Ya got that? Paulo says that thar's no question bout it. Thar's deficient demand out in them thar hills. An y'all see that l'il ol' dyergram up thar? Well...that thar jus' goes ta prove it. Lessen' yer blind, that is. Lessen' yer sum evil laysay fare type. Well, I hate to break it to those who demand and consume this brand of religion, but there might just be some question about it. Shhhh...what I am about to say is super secret...economists aren't really sure what's going on. I mean, think about it. If we knew what was going on, there would be no need for economic research. You know...research...that activity that brings so much joy to you know who (The Joy of Research). But I don't want to be too hard on Paulo. Evidently, he has an agenda to push and he pushes it from a particular philosophical perspective. I can respect that. What I don't like is the constant allusion to certainty--the lack of humility in what we know--the notion that the data "speaks for itself." These are the tactics used by politicians, not academics. This is what I find so tiresome in his otherwise fine writing. But maybe I should cut him some slack. Evidently, it must be some sort of Nash best-reply to fluff up one's feathers this way and show no sign of weakness. There is always some right-wing nut job out there waiting to pounce, to tear apart, and to misrepresent anything that might be construed as capitulation on his part. He knows this. I know this. Now we all know this. So let's set it aside and take a closer look at that data. 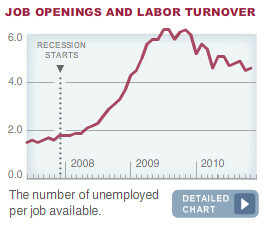 The chart above appears to be drawn from the Job Openings and Labor Turnover Survey (JOLTS). This is a great data set, but it has its limitations. The question I'd like to ask is whether it really is the case that there are more unemployed workers than available jobs. According to JOLTS, the answer is yes. But this does not mean it is so in the economy. So there's no question that right now, the supply side is what is constraining unemployment. The shaded regions roughly depict the periods over which the unemployment fell from peak to trough. As you can see, what the U.S. is experiencing right now looks a lot like what Canada experienced in the early 1990s. Evidently, it takes time to rebuild the employment stock after a shock. And the bigger the shock, the longer it seems to take. Is this a puzzle? Not if you believe we've experienced a Humpty Dumpty moment; but it is if you believe in Deflated Balloons; see here. Yah...see that protracted decline in the Canadian unemployment rate from 1992 to 2008? That was because of deficient demand. Demand was clearly deficient for almost 20 years. Shoulda increased G more, I guess. As some of you probably know, I am a Canadian citizen and have lived most of my life in Canada. I moved to the United States about a year and half ago. I now live in St. Louis and am privileged to be working at the Federal Reserve Bank of St. Louis. The Fed, incidentally, offers what I think is an excellent health benefits package. And so far, I have been mightily impressed with the health care services provided at Barnes Jewish Hospital. I am fortunate. When I first moved here, I did not know too much about how health coverage worked in the U.S. Heck, I am still not entirely sure what to believe. I have some vague recollection of hearing stories about poor Americans being denied access to critical care, just because they could not afford it. I wonder whether this can possibly be true. Here is an excerpt from Paul Krugman's piece "A Tale of Two Moralities:"
There’s no middle ground between these [conservative and liberal] views. One side saw health reform, with its subsidized extension of coverage to the uninsured, as fulfilling a moral imperative: wealthy nations, it believed, have an obligation to provide all their citizens with essential care. The other side saw the same reform as a moral outrage, an assault on the right of Americans to spend their money as they choose. Wealthy nations, liberals believe, have an obligation to provide all their citizens with essential care. The implication, of course, is that the United States does not do so; at least, not prior to Obamacare. But is what Paul Krugman asserts true? (He is also asserting that conservatives, as a matter of their moral philosophy, do not believe that all citizens should be provided with essential care--an outright lie, of course--but a different matter that I do not wish to pursue here). And here is Kevin Horrigan, a columnist in St. Louis with his article today: "A Commodity or a Right?" Health care, regardless of its considerable effect on the economy and the national debt, is not just another consumer item. Like food and water, health care is a fundamental right. We don't let people starve or freeze to death in this country (usually), so why do we routinely let them suffer and die for lack of access to health care? Again, I ask whether this last claim is factually correct? Do people in America routinely suffer and die for lack of access to health care? Personally, I cannot say for sure one way or the other. My inclination is to doubt these claims (which is not to deny the existence of many other problems associated with healthcare). But the evidence supporting my view is mainly anecdotal. When I first got to the bank, I became friends with one of the janitorial staff at the gym. We got to talking and I learned that she had at one time needed a lung operation. Evidently, she was poor and uninsured at the time. She is now healthly as a horse. I'll let you fill in the blanks. Shortly after that, I attended a lecture by Steve Lipstein, CEO and president of Barnes Jewish Hospital (and Chairman of the Board of the St. Louis Fed). The talk, as far as I can remember, was largely devoted to espousing the virtues of the Obamacare legislation. In his talk, he made a remark that made my jaw drop to the table. He told the audience that Barnes-Jewish does not turn anyone way; they do not ask whether people have insurance...they do not even ask if they are American citizens. I would like to believe that this is true at all U.S. hospitals, but perhaps it is not. So it seems to me, though I stand corrected if wrong, that the U.S. already has universal health care coverage. Of course, when the uninsured go for treatment, someone has to pay for it. That someone, it appears, is the rest of us who regularly make insurance premiums (this is another point made by Lipstein in his talk). In other words, the U.S. already has a system whereby the "rich" subsidize the insurance and health costs of the "poor." Of course, recognizing this (if it is even true) is not the same thing as claiming that the current system is any good or in no need of reform. I found this article by Randall Hoven quite interesting: "A Conservative Case for Universal Health Coverage." The impression I am forming is that the healthcare debate has more to do with insurance than it does with healthcare availability. It appears to be a quirk of the American system that health insurance is tied to your employer. So, if you lose your job, and suddenly become sick (afflicted by a pre-existing condition), you may suddenly find yourself uninsurable. You will still have access to healthcare, of course--that is not the issue (even if liberals like Krugman and Horrigan would like us to believe this to be the case). But if you have any assets, you will have to use these assets to pay for your healthcare. This can be a terrible hardship and, evidently, is a major cause of personal bankruptcies in the U.S. Of course, if you are poor, you have no assets and so this does not apply. So I am wondering: Have I got this just about right? If I have missed the boat on this one, please set me straight. One of my readers sent me something that I thought was too good not to bring to the forefront here. The author goes by the name of "o.jeff," in case that means anything to you. * Each person is required to put 15% of his or her income into a health savings account. * All health care spending comes from this account. * If a charge to your health care account is larger than your balance, then your account balance goes negative. This is effectively a federal health care loan. * When your account balance is negative, 20% of your income is deducted from your income until your account balance is positive again. * The money in this account is your money. When you die, any positive balance is passed on in your estate. If you have a negative balance, your assets must first pay off any negative balance in your health care account. * If you have insufficient assets to pay off your negative balance at death, then the balance is "written off." * This program replaces all government health care programs, including Medicare and Medicaid. The taxes for these programs would be eliminated. * Most employers would probably stop offering health insurance as a job benefit. This would free every private employer of this burden and the cost it levies on them. This makes U.S. businesses more competitive. * The payment for health care services would be immediate and swift--like using a credit card at Wal-Mart. However, providers would be required to retain records about the transaction for a period of time to allow audits for fraud. * All of the people who are presently employed in medical offices and hospitals to fight insurance companies could be repurposed into actually providing health care services. An enormous gain in productivity. * Doctors might get tired of answering the question "How much does this cost?" but the question will be coming from their patient, right in front of them, rather than some nameless guy at an insurance company. * Cost shifting already happens when non-insured/indigent go to a hospital for treatment. This plan simply makes it very transparent. These people will carry a negative balance funded by all of us. The hospitals would not have to cost shift, and so their prices should become more reasonable immediately. * The health savings account would be for legitimate health care spending only. Fraud would be very strictly punished--both on the side of the provider and consumer. * Health care products and services typically covered by an employer-sponsored plan would be eligible. * Dependents would be paid for out of their guardian's accounts. * 15% would be a minimum. You could deduct more if you want. * Funds would be deposited in FDIC/NCUA insured bank accounts. You would get to pick the institution. I would likely pick a local credit union. * I think we should probably include in this plan a sales tax on medical care and services to pay for indigent care (those who die with negative balance). This tax should cover whatever our generation is predicted to cost in indigent care. It might be 3-5%. * Private health insurance would be largely eliminated. However, insurance companies might provide "negative balance" insurance. That is, when you die with a negative balance, the insurance would payoff your balance. This would avoid an asset sale when a spouse dies first, for example. Singapore has a system similar to this. My novel contribution is the notion of a "negative balance" in the health saving account, which is effectively a government-provided loan for health care (displacing the insurance model we have today). p.s. Those who have zero lifetime earnings would simply die with a negative balance (and no assets), which would be paid for via the sales tax levied on all medical care. U.S. Treasuries over the last two years have served as sort of a safe-haven for investors (something that still has gold bugs scratching their heads). But with the worst of the financial crisis over, and growing evidence of U.S. and world economic expansion, there is good reason to believe that long-term real interest rates are likely on the way up (reflecting the increasing world demand for investment). Ceteris paribus, higher real rates also imply higher nominal rates. That's bad news for treasuries. And though the Fed has promised to keep inflation in check (around 2% per annum), the market might have different ideas concerning the Fed's willingness and/or ability to deliver on its promise. Market expectations of inflation appear to have risen lately. Via the Fisher relation, one would expect this to put further upward pressure on nominal interest rates. Again, this is bad news for treasuries. Note that I am not personally making any forecast about where interest rates are likely to go in the future. All I want to say is that IF you believe nominal interest rates are likely to continue their way upward, you may want to play this by shorting U.S. treasuries. And an easy way to do this is to go long on the Proshares Ultrashort 20+ Treasury ETF; see recent performance below (on Canadian exchanges, try ticker symbol HTD). What could go wrong with this trade? Well, the fact remains that U.S. treasuries are likely to retain their role as a safe-haven instrument, at least for the near future. So, surprise events in sovereign debt markets﻿, for example, may very well make TBT tumble again. And then there's the Middle East...what could possibly go wrong there? The backdrop here is Bill C-32, an Act to amend the Canadian Copyright Act. The bill would criminalise the act of circumventing, or making available to the public the ability to circumvent, digital rights management software locks. In short, the bill is basically designed to strengthen property rights over intellectual property. Contrary to what many may think, the economic argument for these laws is not as strong as one might imagine. For those interested in understanding why, please refer to this fine blog by Michele Boldrin and David Levine: Against Monopoly. In Canada, we have Michael Geist offering good arguments against certain aspects of C-32. But the purpose of this post is not to debate C-32. What I want to show you is this: a letter recently published in a major Canadian newspaper, written on behalf of a group of "concerned Canadian authors." Despite C-32's attempt to strengthen copyright law, these authors evidently do not think it goes far enough. The reason for this is because C-32 may allow for some degree of fair use. (For related commentary, see Meera Nair's interesting blog: Fair Duty). Anyway, take a look at the letter. Who did they employ to write it? I mean, it's one thing to state one's objections to a pending legislation; I have no problem with this. But the tone...the language...my goodness...it reads as if it were written by a petulant child (and this is perhaps giving them too much credit, as I think the maturity level in most children exceeds that which is displayed in this letter). But what really got me was the concluding statement.